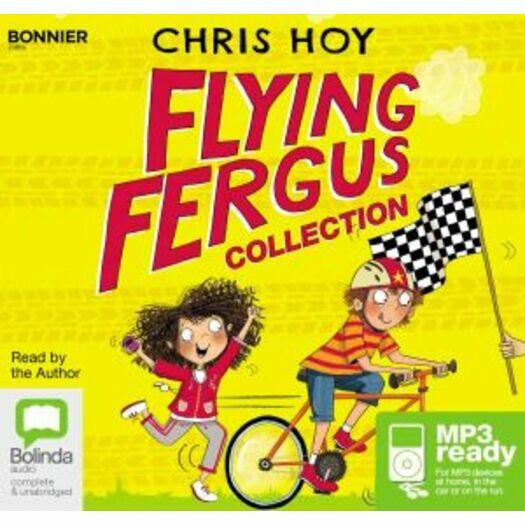 A collection of four stories from the fantastically fun, magical cycling adventure series, Flying Fergus. The Best Birthday Bike: Fergus Hamilton, a boy who always dreams big, gets a rusty old bike for his ninth birthday from his mum and granddad. When he takes it for a test run, he discovers something amazing - when the pedals turn backwards, Fergus and his dog, Chimp, are transported to the magical land, Nevermore. The Great Cycle Challenge: Fergus takes a magical trip to Nevermore, where he and Princess Lily discover a magical compass bell once owned by Fergus's dad. The Big Biscuit Bike Off: Disaster strikes the the Hercules Hopefuls when local biscuit company, Bruce's Biscuits announce plans to build their new factory on the common. Fergus hopes that if he can find Dad in Nevermore he might have a bright idea to help them. The Championship Cheats: It's time for Fergus and his Hercules' Hopefuls teammates to go to the District Championships, where they're determined to beat the superior Wallace's Winners.